Vietnam’s benchmark VN-Index put an end to last week’s surge on May 31, as investors became wary due to the instability of global markets. The shares of 230 companies and four mutual funds listed on the Ho Chi Minh Stock Exchange dropped by 5.55 points, or 1.08 percent, to 507.44. Liquidity on the market fell by 30 percent over the previous trading session, as 44.8 million shares changed hands at a value of VND1.28 trillion. Among the index members, 49 gained, 165 declined, while 20 were unchanged. Hoang Long Group (HLG), which fell the daily maximum 5 percent allowed limit to VND39,900 from VND42,000, led the losers on the city bourse. Thuan An Wood Processing Joint Stock Company (GTA), located in the neighboring province of Binh Duong, lost 4.92 percent to trade at VND11,600. Chuong Duong Beverages Joint Stock Company (SCD) closed at VND31,000, down 4.91 percent. Transport Engineering Construction & Business Investment Stock Company 584 (NTB) topped the list of most active shares in volume with 2.56 million shares changing hands. From June 2 to August 2, Nguyen Vu Thai Quang, a major shareholder of the Transport Engineering Construction & Business Investment Stock Company 584, registered to sell 500,000 shares, reducing his holdings to 1,502,000 shares, accounting 4.18 percent of the chartered capital, to restructure investment category. Vietnam Electricity Construction Joint Stock Corporation (VNE) followed with 2.09 million shares trading up 3.98 percent. Saigon Securities Inc. (SSI) dropped to third place with more than 1.9 million shares traded today. Idico Urban and House Development Joint Stock Company (UIC) rose as much as 4.97 percent to VND38,000. The Vietnam Securities Depository announced that June 8 would be the last day to register to pay dividends by cash of the Idico Urban and House Development Joint Stock Company. Accordingly, UIC will pay dividends at a rate of 4 percent per share. Bien Hoa Sugar Joint Stock Company (BHS) climbed 4.92 percent to VND34,100. At the smaller bourse in the north, recovery also ended as the Hanoi’s HNX-Index decreased 3.11 points, or 1.87 percent, to 163.6 points. 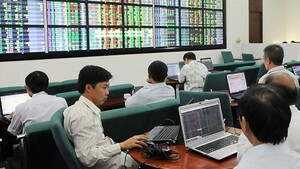 Trading volume fell by nearly half over the last trading session to 29.9 million shares worth more than VND999 billion. Meanwhile, the UPCoM-Index rose 0.3 points or 0.61 percent to 49.32. The market of unlisted stocks saw 45,740 shares changing hands at VND727 million. Internationally, the MSCI index fell 0.3 percent to 113.14 points as of 10:15 am Vietnamese time. Japan’s Nikkei 225 lost 0.21 percent while Australian All Ordinaries and China’s Shanghai Composite sank 0.3 percent. However, Korea’s Kospi advanced 0.3 percent; Taiwan’s Taiex surged 0.02 percent; and Hong Kong’s Hang Sheng increased 0.24 percent.